Ask Archangel Michael for assistance to clear any old attachments to fear that stem from past relationships, freeing you from destructive patterns in your life. In this way you can move forward with your life and enjoy new relationships. Archangel Michael is often referred to as the cord cutting angel so if negativity from a past relationship is interferring with your present life then you can call on him for his help. His sword can cut through the etheric cords that bind you to the toxic energy it generated. Action steps: Think of a question or situation that you would like help with. Then say aloud or silently. 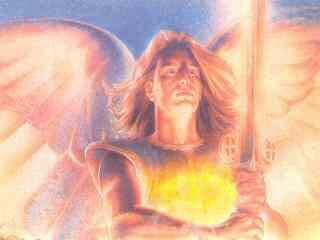 "Archangel Michael, I call upon you now. Please cut the cords of fear that have been blocking or draining me in the past. I am now willing to trade all pain for peace"
If you think of a specific person during this process, ask Michael to help you release the fear from that relationship. You may actually feel a slight shudder in your body as cords are cut one by one. Don't worry; you can't sever cords of love. Repeat this process anytime you feel drained or blacked, as cords can grown back and fear may return.